2018 in Review | Sharp Innovations | Sharp Innovations, Inc.
Perhaps the most exciting news of 2018 for us was finally obtaining a certification we’ve been working toward for quite some time. 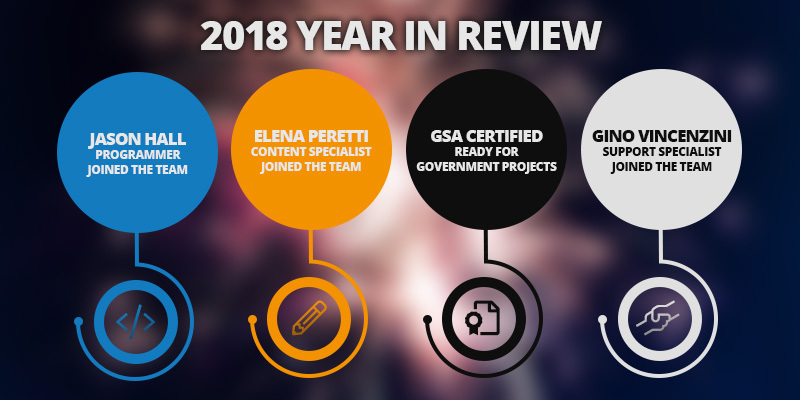 Rewarded for an effort that stretched over three years, we completed the process to become GSA certified. This allows us to work with all government agencies, whether at the state or federal level, for all their web development and digital marketing needs. We’re one of the select few firms in PA who can do so, and we look forward to this new set of challenges. Jeff Utz and Jason Hall joined our development and programming team, bringing decades worth of experience in their fields. Some of you may recognize this name: Todd Bookman returns to the firm after several years working at another agency. Todd brings a unique mix of server administration, email/server support, IT, and other helpful skills that help him troubleshoot a variety of problems for clients. Gino Vincenzini took on our support role, and has already helped troubleshoot hundreds of your email questions, update your website, and the variety of daily tasks clients may require. Our digital marketing team also added content marketing specialist Elena Peretti, who has been a vital addition in allowing us to expand on our current offerings. Speaking of expanding our current digital marketing offerings, we spent some time reviewing the range of services and what kind of results our clients have seen on our programs. There was clearly a strong connection of our most successful clients utilizing a mix of strategies such as SEO, PPC, social media management, blogging and more. In order to maximize the value of our programs and the results for each client, we’ve increased the hours dedicated to each level of digital marketing and have bundled these services together. This allows us to custom tailor each program to your specific business! Finally, as a reader of our blog we’ll let you in on a little secret. We’re nearing the launch of our brand-new website that reflects our growth and evolution better than our current site. 2019 is the 20-year anniversary for Sharp Innovations, and we have some special celebrations in the works that will include all of you as a special thanks! We thank you all for joining us on this journey; if there is anything we can do to help your business or your website, just give us a call at 717-290-6760 or email us at support@sharpinnovations.com and we’ll be happy to help.